Editor's note: This profile is part of a series showcasing students in the School of Molecular Sciences. Samuel is also is a mentor in the School of Molecular Sciences' Early Start program, a two-week immersion program that gives incoming freshmen a jump start on their college careers, offering them support and resources such as connections to their peer group and mentorship from upperclassmen, faculty and academic advisors to help them succeed at ASU. Question: When did you first realize that you wanted to study chemistry? 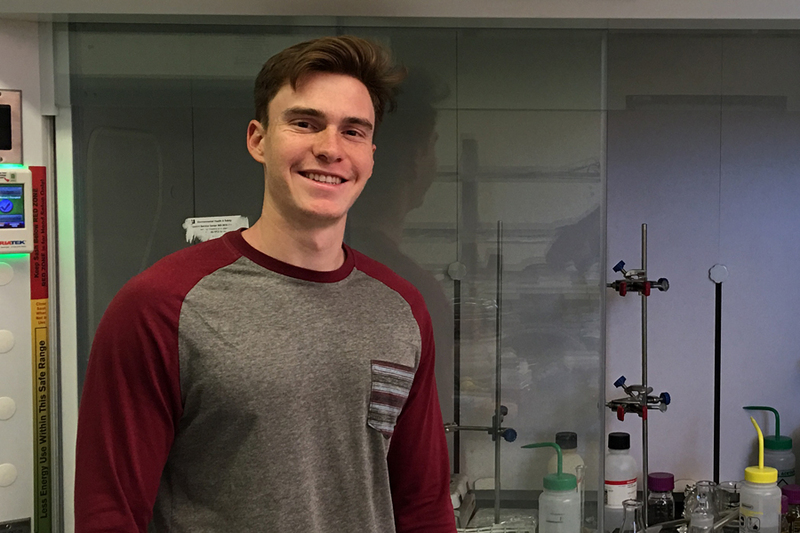 Answer: I first realized that I wanted to study chemistry during my sophomore year, when I took organic chemistry with Dr. [Ian] Gould. Up to that I point I had been an engineer, but I instantly fell in love with the content of the class and constantly thought about learning more about the subject. A: I’m originally from Phoenix so it was close, and tuition was very affordable. I also received a great scholarship from the university. Q: What research opportunities have you had as a student here, and can you describe your research experience? A: I have been involved in the research lab of Dr. Jia Guo since my sophomore year. The lab centers around studying disease, and my main contribution to the group has been the synthesis of an organic molecule that can be used to connect to fluorophore probes. Q: What are some extracurricular activities that you enjoy at ASU? A: I enjoy being outdoors and doing outdoor activities such as hiking. The weather in Arizona is rarely cold, which makes it an excellent place to hike, fish and camp. Q: Can you tell us a little bit about the Early Start program, where you were a student mentor? A: I worked as a mentor for Early Start this summer and into the fall semester with Dr. Gould to help incoming freshman get better acclimated to college life, and to help them with the transition from living at home. I really enjoyed the program, which consisted of helping them understand what's expected of them throughout their college experience and how to conduct themselves with professors. There was even a seminar where they were given an exam on material they had been taught to give the students an understanding of how to prepare for exams in college. There were several incoming freshman that I met that were extremely smart, and I look forward to seeing how they develop in both their academic and professional careers. Q: What’s something you have learned while at ASU — in the classroom or otherwise — that surprised you or changed your perspective? A: You might think you know what you want to do, but then suddenly you can have a complete change of mind based on one class. I found a class I loved more than anything else my fall semester of senior year. So don’t be afraid to take all different types of classes (chemistry related or not). Q: What is your favorite spot on campus, whether for studying, meeting friends or just thinking about life? A: My favorite spots on campus are the corner private rooms in Noble library. They let in the most sunlight during the day, and they offer a nice view when I want to take a break from studying. Another place very close to campus that I enjoy a lot for getting work done is Cartel coffee. A: After graduation, I want to go on to complete my PhD in inorganic chemistry and eventually become a professor at a university. Q: What’s the best piece of advice you’d give to students interested in coming to ASU to study chemistry or biochemistry? A: It doesn’t come naturally, and you should not be afraid to ask a lot of questions or go to office hours. There’s no shame in putting forth your own effort and enthusiasm; your professors want to teach for a reason! To help NASA better explore outer space, Yuji Zhao headed to Capitol Hill with NASA’s best and brightest collaborators in academia to talk space tech with U.S. Congress members. The important research Zhao presented involves high-temperature solar cell technology for missions that head to the very hot planet Mercury. “One major breakthrough is we can develop a solar cell that has improved performance over high temperatures, whereas the silicon cells we have now would degrade with higher temperatures,” Zhao said. Silicon-based solar cells at room temperature (20–25 degrees Celsius, 68–77 degrees Fahrenheit) operate at 80 percent capacity, but at 80 degrees Celsius or 176 degrees Fahrenheit it degrades to 20 percent, Zhao said. Gallium nitride based solar cells, however, operate at 50 percent capacity at room temperature and all the way at 300 degrees Celsius or 572 degrees Fahrenheit they operate at 80 percent capacity. Zhao has also been using gallium nitride to power electronics as part of research supported by NASA as well as the Department of Energy’s Advanced Research Projects Agency-Energy and the Department of Defense’s Defense Threat Reduction Agency. Zhao has also received the NASA Early Career Faculty Award and participated in the NASA HOTTech Program. NASA officials have also visited Zhao’s Metal-Organic Chemical Vapour Deposition Lab at ASU for a workshop on photovoltaics in December 2016, and in November 2017 Zhao was invited to NASA’s Glenn Research Center in Cleveland — its major research center for high-temperature electronics and photovoltaics for Mercury and Venus missions — to talk about gallium nitride and its role in the future of space technology. Zhao’s rich history of NASA-supported research was a major factor that led to his invitation to the NASA Tech Day event. Along with the other faculty members, students funded by NASA grants were also invited to attend. “NASA wanted to showcase the best research they have supported from the leading universities in the U.S.,” Zhao said. The event included a poster session, technology demonstrations and talking with members of Congress. 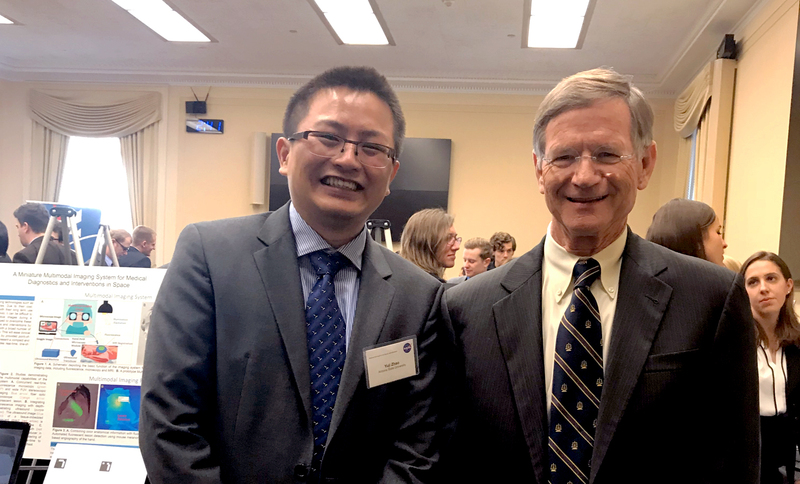 Zhao was also able to meet with Lamar Smith, chairman of the committee for space, science and technology and U.S. Representative of the 21st Congressional District of Texas. He also met with the staff of Kyrsten Sinema, U.S. representative from Arizona’s 9th Congressional District, and Andy Biggs, U.S. representative from Arizona’s 5th Congressional District. "I enjoyed meeting Dr. Zhao in D.C. last year and learning about critical advances in science and technology at ASU," Biggs said. "Dr. Zhao's work is especially relevant to our aerospace industry, including the aerospace and defense companies in Arizona's 5th Congressional District." Sinema also noted the value government-research partnerships add to the state's economy. "Dr. Zhao's work in Tempe shows the value of investment by the federal government into scientific research and the potential significant economic impact that research can have," Sinema said. Zhao hopes to continue the discussion with local representatives to help foster a relationship between government and academia and support for local engineering and technology efforts — a goal also supported by Kyle Squires, professor and dean of the Ira A. Fulton Schools of Engineering.